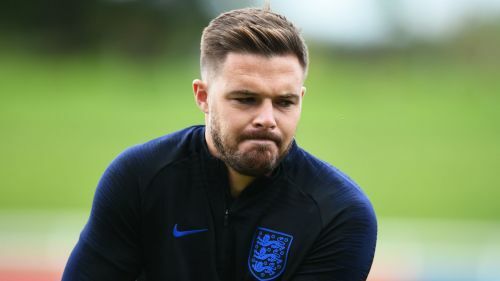 Jack Butland has received assurances from Gareth Southgate that his England place is safe despite playing in the Championship for Stoke City. Butland earned his ninth international cap and kept a clean sheet in Tuesday's 1-0 friendly win over Switzerland at the King Power Stadium. The goalkeeper is England's only squad member picked from outside the Premier League, having been relegated with Stoke last term. And while his place in Southgate's plans is not under threat at the moment, the 25-year-old knows that situation could change if he remains in the second tier beyond this season. "You can argue the standard of opposition [in the Championship] is different, but ultimately it's still a very demanding league," the former Birmingham City man told Sky Sports. "I still have to be at the top of my game, still have to be fit, strong, train well and ultimately play well. "If I can do that I'd like to think I can stay in the squad. "If I'm in the Championship beyond this season then obviously things start to get a little bit trickier. But certainly this year, if I can keep standards high, he's reassured me I can be part of the team." Uncapped pair Alex McCarthy and Marcus Bettinelli both earned call-ups during the international window as Southgate examined his long-term goalkeeping options. Everton's Jordan Pickford remains the established number one, with Burnley trio Joe Hart, Tom Heaton and the injured Nick Pope on the fringes.